1I appeal to you therefore, brothers, by the mercies of God, to present your bodies as a living sacrifice, holy and acceptable to God, which is your spiritual worship. 2Do not be conformed to this world, but be transformed by the renewal of your mind, that by testing you may discern what is the will of God, what is good and acceptable and perfect. Set Our Minds On Things Above Col 3: 2-3 above = heavenly and earth pertains to where we currently live and operate in this space and time realm in which God uses to prepare us for eternity. Rom 12: 2 The Mercifully transformed Mind Thinks God’s Thoughts & Teams Together with God’s Will. Rom 2: 13-15 to have the law written on our hearts that have been circumcised by God to receive it. Rom 4: 1-25 God’s Promises are realized through faith. Rom 6:1-4 God baptized us into Christ’s death, burial & resurrection, Rom 6: 21-23 liberates us to sanctification & eternal life! (God does it – not man. No human ritual accomplishes what God does spiritually when we receive Christ. Yet we are encouraged by Scripture to be Baptized as a reflection of what God does spiritually upon our salvation. Rom 8: 1- to be released from condemnation as adopted heirs with Christ, who are more than conquerers. Rom 9: 1-33 The Gospel’s elected Hebrew root supports the elected gentile grafted in fruit! Rom 10: 9 to be whosoever’s who confess our belief and thus are saved. All will be saved, who do two things: 1) confess with our mouths that Jesus is Lord and 2) believe in our hearts that God raised him from the dead! Rom 11: 29-33 The 33depth of the riches, wisdom and knowledge of God are manifested in how 29For the gifts and the calling of God are irrevocable (without repentance). Rom 15: 1-5 to be strong to bear with the failings of the weak, and have the Holy Spirit’s endurance and encouragement to live in harmony together so with one voice we glorify the God and Father of our Lord Jesus Christ. Rom 16: 1-27 to welcome each other in the Lord as fellow workers in Christ Jesus who cooperate with God to bring about the obedience of faith. 7But we have this treasure in jars of clay, to show that the surpassing power belongs to God and not to us. 8We are afflicted in every way, but not crushed; perplexed, but not driven to despair; 9persecuted, but not forsaken; struck down, but not destroyed; 10always carrying in the body the death of Jesus, so that the life of Jesus may also be manifested in our bodies. 11For we who live are always being given over to death for Jesus’ sake, so that the life of Jesus also may be manifested in our mortal flesh. 12So death is at work in us, but life in you. 13Since we have the same spirit of faith according to what has been written, “I believed, and so I spoke,” we also believe, and so we also speak, 14knowing that he who raised the Lord Jesus will raise us also with Jesus and bring us with you into his presence. 15For it is all for your sake, so that as grace extends to more and more people it may increase thanksgiving, to the glory of God. Our Living Sacrifice is in Jars of Clay! as a living = as one who is experiencing God’s gift of life. sacrifice, = offering official sacrifice prescribed by God; hence an offering the Lord accepts because it is offered on His terms. The first question, WWJD, is a boldly misdirected assumption that places us on par with Christ which is highly presumptuous on our part. holy = set apart by (or for) God, and acceptable = well-pleasing & fully agreeable to God. which is your spiritual = divinely reasonable, (Well cover this in a bit more detail at the end of today’s message. WORSHIP — rational service = service rendered to God, perhaps simply (occurs five times in the NT: Jn 16:2; Ro 9:4, 12:1; Heb 9:1,6). Wesley says of vs. 15 If any man love the world – meaning Seeks happiness in visible things, he does not love God. “15Do not love the world or the things in the world. If anyone loves the world, the love of the Father is not in him. Wesley says of vs. 16 The desire of the flesh is “Of the pleasure of the outward senses, whether of the taste, smell, or touch. The desire of the eye – Of the pleasures of imagination, to which the eye chiefly is subservient; of that internal sense whereby we relish whatever is grand, new, or beautiful. The pride of life = All that pomp (vain and ostentatious display) in clothes, houses, furniture, equipage, manner of living, which generally procure honour from the bulk of mankind, and so gratify pride and vanity. It therefore directly includes the desire of praise, and, remotely, covetousness. All these desires are not from God, but from the prince of this world. Gal 6:14 14But far be it from me to boast except in the cross of our Lord Jesus Christ, by which the world has been crucified to me, and I to the world. Since we are born naturally in the world, we must be renewed by the Holy Spirit to break the carnal connection to it. Col 3: 2-3 2Set your minds on things that are above, not on things that are on earth. 3For you have died, and your life is hidden with Christ in God. above = heavenly and earth pertains to where we currently live and operate in this space and time realm in which God uses to prepare us for eternity. Eph 2: 1-3 says 1And you were dead (3498 nekrós = spiritually necrotic; corpses lacking life”; dead; not able to respond to impulses, or perform Godly, Spiritual functions; “unable, ineffective, powerless,” and unresponsive to the life-giving influences & opportunities of God) in the trespasses (false steps, errors, “slip ups”; wrong doings that can be (relatively) unconscious, “non-deliberate.”) and sins (self-originated moral faults & failures) 2in which you once walked, following the course (path pattern) of this world, following the prince of the power of the air, the spirit that is now at work in the sons of disobedience— (willful unbelief, obstinacy & refusal to be convinced by God’s voice; refusal to be persuaded in their heart concerning obeying His will (Word)) 3among whom we all once lived in the passions (strong urges, which can be positive or negative, depending on whether the desire is inspired by faith of God’s in birthed persuasion) of our flesh, carrying out the desires of the body and the mind, and were by nature children of wrath, like the rest of mankind. John 15:19 — does not love Christ’s disciples. “If you belonged to the world, it would love you as its own. As it is, you do not belong to the world, but I have chosen you out of the world. John 17:14 — hates us. “I have given them your word and the world has hated them, for they are not of the world any more than I am of the world. Daniel 7:23 — NWO will be masked in diversity that devours everything in its path. Thus he said, The fourth beast shall be the fourth kingdom on earth, which shall be diverse from all kingdoms, and shall devour the whole earth, and shall tread it down, and break it in pieces. Revelation 13:3 —And I saw one of his heads as it were wounded to death; and his deadly wound was healed: and all the world wondered after the beast. Character Change means are values have changed. Values motivate and drive behavior. The mind is part of the whole body that we dedicate to the Lord. Transformation = 2 Corinthians 3:18 —. 18And we all, with unveiled face, beholding the glory of the Lord (e), are being transformed into the same image from one degree of glory to another (f). For this comes from the Lord who is the Spirit. 2 Cor 3:18 NLT = So all of us who have had that veil removed can see and reflect the glory of the Lord. And the Lord–who is the Spirit–makes us more and more like him as we are changed into his glorious image. 2 Cor 3:18 BLB (Berean Literal Bible) =And we all having been unveiled in face, beholding as in a mirror the glory of the Lord, are being transformed into the same image, from glory to glory, even as from the Lord, the Spirit. 2 Cor 3:18 NAS = But we all, with unveiled face, beholding as in a mirror the glory of the Lord, are being transformed into the same image from glory to glory, just as from the Lord, the Spirit. 2 Cor 3:18 KJV But we all, with open face beholding as in a glass the glory of the Lord, are changed into the same image from glory to glory, even as by the Spirit of the Lord. “with unveiled face” = 2 Corinthians 3:18, is also used allegorically. of a mind not blinded, but disposed to perceive the glorious majesty of Christ. The sacrifice of the wicked is abomination; how much more, when he bringeth it with a wicked mind Proverbs 21:27. Memory; remembrance; as, to put one in mind; to call to mind; the fact is out of my mind; time out of mind from the operations of the intellect in man, this word came to signify. The intellectual or intelligent power in man; the understanding; the power that conceives, judges or reasons. So we speak of a sound mind, a disordered mind, a weak mind, a strong mind with reference to the active powers of the understanding; and in a passive sense. When we speak of mental capacity, we mean the mind’s ability to comprehend a subject. Proverbs 21:27 — The sacrifice of the wicked is abomination: how much more, when he bringeth it with a wicked mind? (15) Failure to acknowledge the God of the Bible is God & failure to worship Him leads to sin and frustration! The more we give ourselves over to the SD&RR or PPP, the lower our capacity to be filled with God’s LPJ. Meaning: God’s “preferred-will,” and “best-offer” to people, who either can accept or reject it. The Church operates in Contrast to the world; Not in conformity with the world. The world operates in contrast to God’s will for His disciples, who should not conform to the world in the name of relevance. (John 17:16). Christ positions His Church to be a contrast to the world. The church is in (operating within the instrumentality of) the world (John 17:11). “Fear mingled with respect and esteem; veneration. The fear acceptable to God, is a filial fear — the respect a child has for a parent. The fear of the Lord is an awe-filled reverence of the divine nature, proceeding from a just esteem of his perfections, which produces in us an inclination to His service and an unwillingness to offend him. To regard with reverence; to regard with fear mingled with respect and affection. We reverence superiors for their age, their authority and their virtues. We ought to reverence parents and upright judges and magistrates. We ought to reverence the Supreme Being, his word and his ordinances. An act of respect or obeisance; a bow or courtesy. 2 Samuel 9:6. KJV – Now when Mephibosheth, the son of Jonathan, the son of Saul, was come unto David, he fell on his face, and did reverence. And David said, Mephibosheth. And he answered, Behold thy servant! Mt 21:37 Now when Mephibosheth, the son of Jonathan, the son of Saul, was come unto David, he fell on his face, and did reverence. And David said, Mephibosheth. And he answered, Behold thy servant! The Church should operate in a “Relevant Reverence vs. seeking a “Relevance that Tolerates the world’s way of thinking, and compromises the telling of the Biblical Gospel. So we should not conform to the world in the name of relevance. We instead, should be focused on bringing people into a Reverent relationship with the God of The Bible. (John 17:16). Christ positions His Church to be a contrast to the world. 16But I say, walk by the Spirit, and you will not gratify the desires of the flesh. 17For the desires of the flesh are against the Spirit, and the desires of the Spirit are against the flesh, for these are opposed to each other, to keep you from doing the things you want to do. 18But if you are led by the Spirit, you are not under the law. 19Now the works of the flesh are evident: sexual immorality, impurity, sensuality, 20idolatry, sorcery, enmity, strife, jealousy, fits of anger, rivalries, dissensions, divisions, 21envy, drunkenness, orgies, and things like these. I warn you, as I warned you before, that those who do such things will not inherit the kingdom of God. 22But the fruit of the Spirit is love, joy, peace, patience, kindness, goodness, faithfulness, 23gentleness, self-control; against such things there is no law. 24And those who belong to Christ Jesus have crucified the flesh with its passions and desires. (19) Rom 12: 2 The Mercifully Transformed Mind Thinks God’s Thoughts & Teams Together with God’s Will. Gal 5: 22-24 The fruit of the Spirit = the outgrowth of everything done in true partnership with Christ, who is the vine upon which each believer branch depends. (John 15 1-11). If we think God’s thoughts we get feelings that are consistent with Gal. 5:22-24 the Fruit of The spirit, each of which is manifested through our emotions. The benefits to overcoming the world include how in Galatians 5: 22-24 we are reciprocated, rewarded, requited, obtain in response to reading God’s word and thinking God’s thoughts, the emotional fruit of 22…the Spirit is love, joy, peace, patience, kindness, goodness, faithfulness, 23gentleness, self-control; against such things there is no law. 24And those who belong to Christ Jesus have crucified the flesh with its passions and desires. (20) Let’s Pray that God ReAwakens, ReInvigorates & ReEstablishes Us in Our Calls In Christ! Let’s Pray: That God will make us willing transformists whose minds He can renew, so our lives conform to His Will! 53So Jesus said to them, “Truly, truly, I say to you, unless you eat the flesh of the Son of Man and drink his blood, you have no life in you. 54Whoever feeds on my flesh and drinks my blood has eternal life, and I will raise him up on the last day. In John 6:55-56 Jesus says, “… 55For my flesh is true food, and my blood is true (True = factual, worthy of credit to provide essential spiritual sustenance, i.e. “EW= “soul food!”) 56Whoever feeds on my flesh and drinks my blood abides (continue to be present) in me, and I in him. When Jesus says in John 6: 53-55 eat my flesh and drink my blood, He obviously is not talking about people trying to gnaw on His body! He fed people real food, and admonished us to appropriate Him spiritually into our lives! 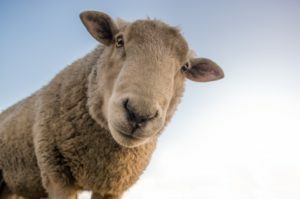 The context of John chapter 6, and the entire Bible is that Christ is not talking about literals chewing on His physical body. Thus, any so-called human ritual that insinuates it is creating that also is out of Scriptural context! The word “eat” is “trogos,” appears to be a strengthened form of the base of the word for “trauma” and tribos through the idea of corrosion or wear; or perhaps rather of a base of trugon and trizo through the idea of a crunching sound; to gnaw or chew, i.e. (generally) to eat — eat. The word for flesh here is “sarx,” [4561 /sárks (“flesh”) which generally, but is not always evil in Scripture. it positively designates the sinless human body of Jesus (Jn 1:14; 1 Jn 4:2,3). 4561 (sarks) is generally negative, referring to making decisions (actions) according to self – i.e. done apart from faith (independent from God’s in working). Thus what is “of the flesh (carnal)” is by definition displeasing to the Lord – even things that seem “respectable!” In short, flesh generally relates to unaided human effort, i.e. decisions (actions) that originate from self or are empowered by self. This is carnal (“of the flesh”) and proceeds out of the untouched (unchanged) part of us – i.e. what is not transformed by God. The bread and wine before us are symbolic of the body and blood of Christ. 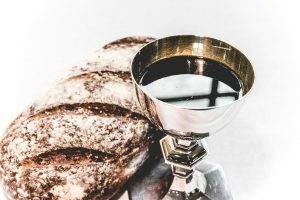 There is not an insignificant amount of theological controversy over how substantially or symbolically the bread and wine are to be interpreted. The Catholic tradition calls this portion of a worship service, “Holy Communion” or the Mass, which ritualizes the bread and wine, believing the substances or “the Eucharistic elements” actually are converted or “transubstantiated” into the actual body and blood of Christ through the consecration activity of an ordained priest or brother. Following this, it is said that what we have before us is only the “appearance” of bread and wine. Lutherans believe in consubstantiation, that the substance of the bread and wine coexists with the body and blood of Christ in the Eucharist. The challenge with this pseudo-Catholic view is that it also violates Romans 10: 6-7, by insinuating humans can by ritual move Christ into or alongside the elements. or (chiefly in the Eastern Orthodox tradition) the Divine Liturgy. See also consubstantiation, transubstantiation. 57As the living Father sent me, and I live because of the Father, so whoever feeds on me, he also will live because of me. 58This is the bread that came down from heaven, not like the bread the fathers ate, and died. Whoever feeds on this bread will live forever.” 59Jesus said these things in the synagogue, as he taught at Capernaum. recall and show respect for what Christ did for us. It also means to celebrate His Sacrifice and Sending His Holy Spirit to live within us by doing what he said on the night He was betrayed. We commemorate not only what Christ means for us, but also what we mean to Him Who redeemed us for the purpose of how He is now a most essential part of who we are, and what we are becoming in Him! No man, priest or otherwise is righteous enough to climb into heaven and bring Christ down into the Eucharistic elements of the mass/holy communion/Lord’s Supper. No human ritual/work can proclaim someone righteous enough to violate Romans 10: 6-7.
it is a practical divine righteousness that properly meets judicial approval. To “Ascend” is negative term for aggressive self-effort in opposition to God’s prescribed will. In Isaiah 14:13 Satan attempted to “ascend and exalt himself above God. Satan said I will ascend…. In Isaiah 14:13 Satan attempted to “ascend and exalt himself above God. To believe we have the ability to ascend “brings down” and degrades Christ’s deity and His sacrificial work on the Cross, as the singular means by which we can be saved. The Heart = the heart; mind, character, inner self, will, intention, center — “desire-producer that makes us tick” (G. Archer), i.e. our “desire-decisions” that establish who we really are.